LOS ANGELES — Lovie Yancey, founder of the Fatburger restaurant chain, which began with a popular post-World War II hamburger stand in South Los Angeles, has died. She was 96. Yancey, who had pneumonia, died Jan. 26 in Olympia Medical Center, said her daughter, Gwen Adair. Yancey already had operated a restaurant in Tucson, Ariz., and was living in Los Angeles in the late 1940s when she began thinking about launching a new food business. "I settled on hamburgers because they were the fastest-selling sandwich in America," she told the Wave newspaper in 1985. Yancey launched her foray into fast food by partnering with Charles Simpson, who worked for a construction company and reportedly used scrap materials to build a three-stool hamburger stand. Opened in 1947, it was called Mr. Fatburger. "The name of the store was my idea," Yancey said. "I wanted to get across the idea of a big burger with everything on it ... a meal in itself." 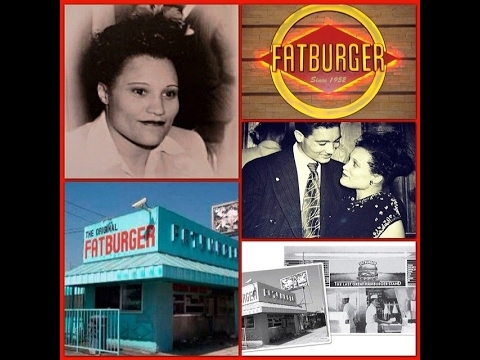 In 1952, Yancey shed her business partner and the "Mr." in the hamburger stand's name, and Fatburger was officially born. "I think of that stand as like a little postwar survivor that's a tribute to the entrepreneurial spirit of an African-American woman who really did usher in what became a very good model for a franchise business," said Adriene Biondo, chairman of the Los Angeles Conservancy's Modern Committee, on Friday. From the beginning, Yancey was a fixture at the original Fatburger, where customers, who included entertainers such as Redd Foxx and Ray Charles, could custom-order their burgers. "I worked 16, 17 and 18 hours a day behind the counter, seven days a week," Yancey recalled in the 1985 interview. "I'd come home, catch a few hours of sleep and start all over again." Adair recalled that her mother "was always there to make sure things were done properly. Even when she was older, she'd sit and talk to the people. That was her life; she loved being around the business." Yancey didn't start out operating an open-all-night hamburger stand, she said in the 1985 interview, "but as word got out how good the food was, we started getting requests from night shift and early morning workers -- bus drivers, mailmen, street sweepers -- to stay open longer." In 1973, Yancey opened a Fatburger in Beverly Hills, which became a favorite destination for celebrity burger buffs such as Elizabeth Taylor, Johnny Carson and Muhammad Ali. "One night, there was some kind of awards (ceremony) and people came in limousines in their tuxes and everything," Adair recalled. "They just closed the door because they couldn't get any more people in there." Over the years, Fatburger has been immortalized as a reference in a string of songs, movies and TV shows, including the sitcom "Sanford and Son," the film "The Fast and the Furious" and the Ice Cube single "It Was a Good Day." 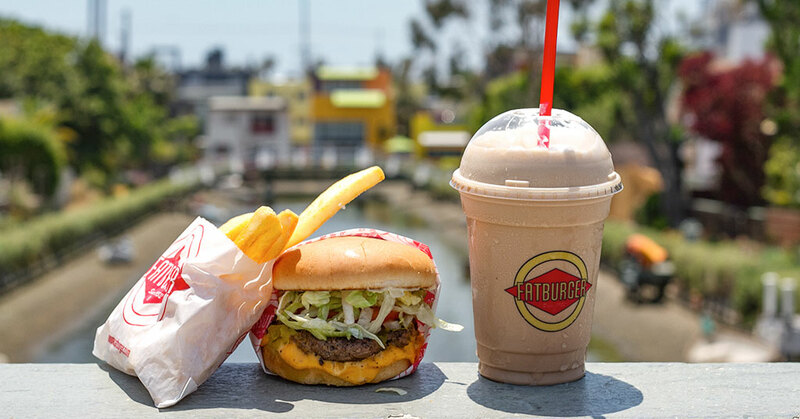 Fatburger even once made David Letterman's Top 10 list for things he would miss most about leaving Los Angeles. In 1981, Yancey began offering franchises in what was billed as "The Last Great Hamburger Stand." By 1985, in addition to four company locations, there were 15 Fatburger franchise sites, with two dozen more expected to open that year. "I don't worry about McDonald's, Burger King or Wendy's," Yancey told the Wave. "They may be more popular, but a good hamburger sells itself, and I don't think anybody makes as good a hamburger as we do." For three consecutive years, beginning in 1985, Fatburger was named in Entrepreneur magazine's annual Franchise 500 list. Yancey sold her Fatburger company to an investment group in 1990 but retained control of the original property. The stand was never designated as a Los Angeles Historical-Cultural Monument. The property was sold last year, and Adair said the new owner plans to develop it. The Santa Monica-based Fatburger Corp., which is owned by Fog Cutter Capital Group, has 93 locations in the United States, Canada and Macao. "We feel privileged to be part of the culture Lovie created," according to a news release from Andy Wiederhorn, chairman of Fatburger. 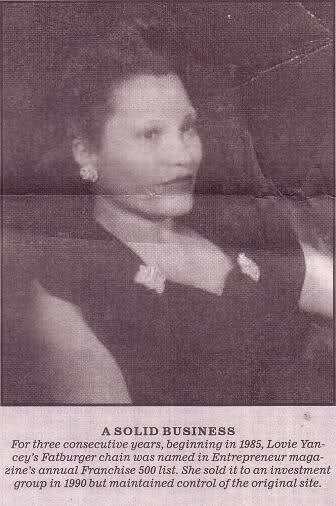 Yancey, who was born in Texas on Jan. 3, 1912, made a $1.7-million endowment to the City of Hope in 1986 for research into sickle-cell anemia in fulfillment of a promise to her 22-year-old grandson, Duran Farrell, who died of the disease three years earlier. In addition to her daughter [Gwen Adair], Yancey is survived by three grandchildren and five great-grandchildren. Lovie's daughter Gwen Adair, right.